Maharshi Debendranath Tagore with twenty followers accepted the Brahmo creed from Ram Chandra Vidyabagish on 21 December 1843 (7 Poush 1250 according to the Bengali calendar). Poush Utsav is started on 7 Poush (around 23 December). At dawn, Santiniketan wakes up to the soft music of shehnai. The first to enter the scenario is the Vaitalik group, who go round the ashrama (hermitage) singing songs. It is followed by a prayer-meeting at Chhatimtala. Then the entire congregation moves on to Uttarayan singing songs.This was the basis of Poush Utsav (the Festival of Poush) at Santiniketan. Poush Mela is an annual fair and festival that takes place in Santiniketan, in Birbhum District in the Indian state of West Bengal, marking the harvest season. Commencing on the 7th day of the month of Poush, the fair officially lasts for three days, although vendors may stay up until the month-end. Pous Mela is characterized by its live performances of Bengali folk music, specially bauls. Traditional bauls, wandering minstrels singing Bengali songs. Tribal dances (Santali) is also the part of the fair.In earlier days the mela (fair) was held in the ground on the north side of Brahma mandir (also referred to as glass temple). On that day, a firework display was held in earlier days after evening prayers. 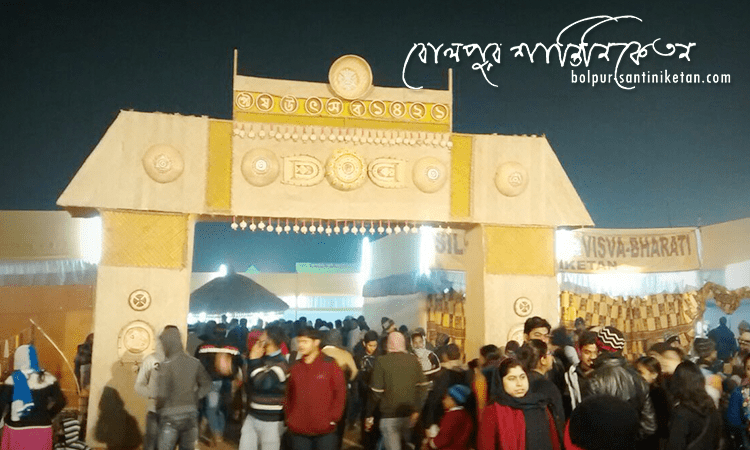 As the Pous Mela increased in size, it was shifted to the field in Purbapalli The students of Santiniketan present their splendid performance and make this festival more enjoyable and glamorous. Each day of this festival is filled with different activities. The last day of this fair is devoted to those who are related to Santiniketan. Poush Mela now attracts the attention of not only the people of Birbhum district but tourists from all around. The fair offers a perfect insight of true heritage of the state.